Hey guy’s, Mike here! Today i’m gonna go over what you need to consider when going about purchasing new skates and knowing what’s gonna work the best for you! When it comes to hockey equipment, it really depends on you and how you play. Especially when it comes to skates, I myself have more narrow feet and i’m more of a Bauer guy. So i’m obviously gonna go with the vapor’s. 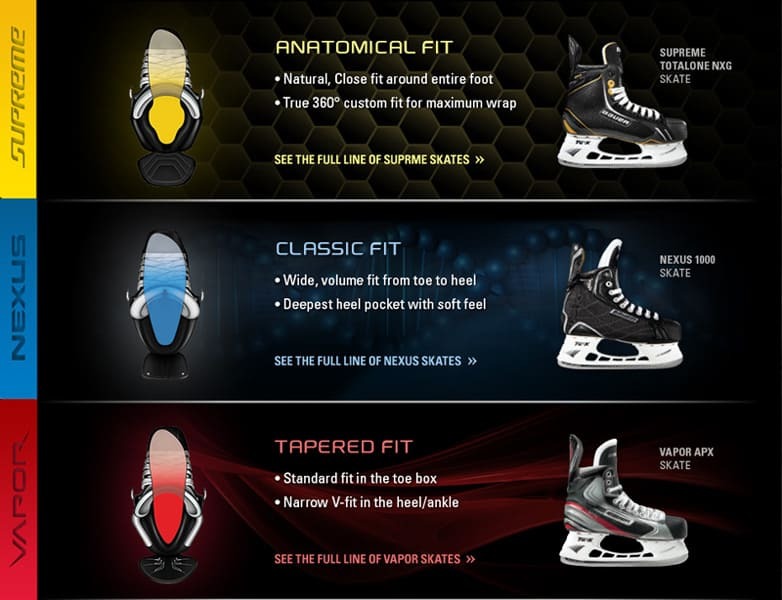 Without further a do lets go ahead and review these skates! The vapor is going to be for the more narrow foot, it’s very light weight in its build with the lighter tounge and the heel is made out of a new material than the previous model which also contributes to it’s light weight as well as it forming to your feet better. The vapor also evaporates sweat a lot faster going more towards the light weight which especially helps in that 3rd period. This skate is going to be the most durable and longest lasting of the three. It’s going to fit people with an averagely wide foot as well. The thing I like about this skate is it’s flexible tenden which allows you to take those stronger strides and get more power. Also the toungue is made very thick to protect you from your laces gripping you or maybe a puck to the laces. The Nexus is paticularly what most pros are wearing in the Bauer line probably due to its very relaxed wide foot feel. Ryan Kesler says what he loves about these is the amount of give they have to them, so if you are a more built player, these are going to be the right skates for you. These skates have a very stiff tendend gaurd staying with the original Nexus feel. I hope this comparison was helpful for you in trying to pick out what would fit you, please remember to truly know what fits you need to go into a hockey store and try on the different fits for yourself because you might be surprised at what is comfortable. I hope you guys enjoyed the review and look forward to the reviews we will be doing in the future!